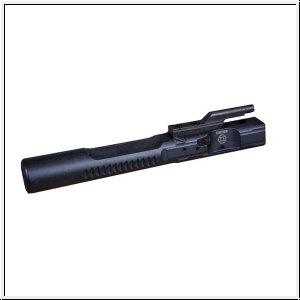 The GEMTECH Suppressed Bolt Carrier is a drop-in replacement and will allow the shooter to choose between suppressed (S) and unsuppressed (U) settings without any permanent modifications to the firearm. No longer will you need to change gas blocks, buffers, or any other components. Not only that, but with the GEMTECH Suppressed Bolt Carrier, there is a reduction in carrier speed and less felt recoil, bringing the cyclic rate of the suppressed rifle down to unsuppressed levels. And in some systems, testing has shown that it can actually bring it LOWER than unsuppressed levels. Reduce Bolt/Carrier speed while suppressed (S - setting) Unsuppressed velocity is unchanged (U - setting) from that of a normal bolt carrier Reduces Felt Recoil Reduces Blowback to shooters face Less wear and tear on weapon system 14.5in Colt M4 – 25% decrease in carrier velocity while suppressed. 10.5in Daniel Defense MK18 – 16% decrease in carrier velocity while suppressed. This Product was added to our catalogue on Saturday, 17. June 2017.